If you are new to the Paramount Gala this year, please keep in mind this is a BIG night of BIG entertainment and fundraising. 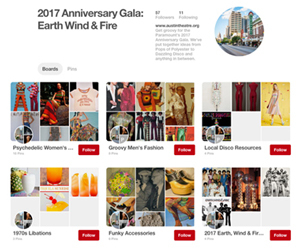 The doors open at 6pm, and you’ll be captivated all night long with music, open bar, a seated dinner in an air-conditioned tent on Congress Avenue, dancing in the streets (literally), and the best auction in town! The attire is everything from Pops of Polyester to Dazzling Disco and anything in between. Everything from Pops of Polyester to Dazzling Disco and anything in between, but keep comfort in mind too (e.g. your shoes), so you can enjoy the post-show event out on two full blocks of Congress Avenue in our air-conditioned tents with dinner, live music, and silent auction. Please plan to park in the One American Center garage. The garage entrance is located on 7th Street (between Colorado and Congress Avenue) on the south side of the street. Simply pull the white ticket at the gate for entrance into the garage, and we will validate your ticket at the event that night. The garage will open at 5pm on May 13th for guests. Also, consider Fasten, Yellow Cab, or other options and remove any worry about transportation. Will call, doors and bars will open promptly at the Paramount Theatre, so please come early for refreshments, mingle with your friends prior to the show and enjoy music by D-Madness. The show in the Paramount begins at 6:30 p.m. with Jackie Venson followed by legendary Earth Wind and Fire. We don’t want you to be late or you may miss some of the amazing show and some of the best auction items in town. After the show, join us at the Congress Avenue Honky Tonk. Two blocks of Congress Avenue will be tented, decorated and air-conditioned. You and your guests will be treated to a fabulous dinner catered by the InterContinental Stephen F. Austin, sweets by Amy’s Ice Cream, specialty drinks by Patron Spirits Company served all night long, and featuring live music by DJ Soul Sister and Bobby Patterson & the Disciples! It will be a full night of fun, including dancing, and Austin’s most impressive silent auction (closes at 11:50pm). All the amazing auction items will be listed in the program for your review and there will be plenty to choose from – all for a good cause. The actual party will head next door to the Terrace Bar at the Stephen F. Austin Hotel at midnight to keep the celebration going. We also have a few rooms available for gala attendees at the Stephen F. Austin Hotel. If you would like to book a room at our special rate, please contact lmartin@austintheatre.org. They are on a first come, first served basis and will sell out – so don’t wait. Thank you again for your support and we all look forward to celebrating the 102nd Year of the Paramount Theatre with you on May 13th!